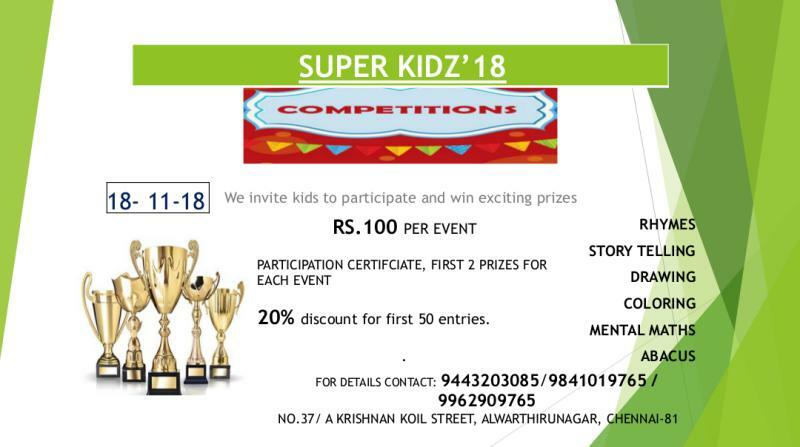 Super Kidz’18 Children’s Day Competitions for Kids. Sheets will be given on the spot. All participating schools / STUDENTS to reach by 8.30 am. For group registrations from schools, apartments should produce valid ID proof (like ID card) Participants must bring all stationary items like pen, pencil, eraser, crayons, paints, chess boards, yoga mats with them. Only sheets will be provided. There are only 2 prizes for each event and a participating certificate will be given to all participants. For Rhymes and story telling properties are allowed. STUDENTS CAN REGISTER IN MULTIPLE EVENTS ACCORDING TO THEIR AGE. EVENTS UNDER THE SAME TIME FRAME WILL BE CONDUCTED ONE AFTER THE OTHER.